Home » Ring Guidance » How much does an engagement ring cost? How much do people generally spend on an engagement ring? What most affects the price of an engagement ring? How do I decide what carat weight to choose? How can I ensure my ring looks great? what shouldn't i compromise on? what do other people choose? how can i maximise the value i receive? If you’ve ever thought about proposing, you’ll also have wondered how much is reasonable to spend on an engagement ring. 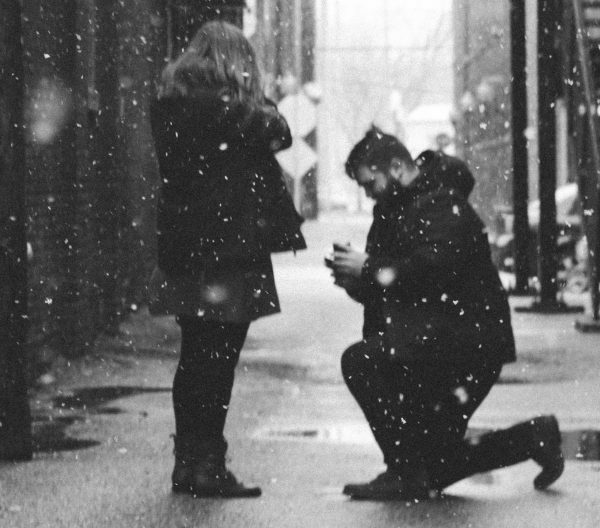 In this article we explore how much each element of an engagement ring can affect its cost, how you can maximise your value for money and how much other people spend on engagement rings. 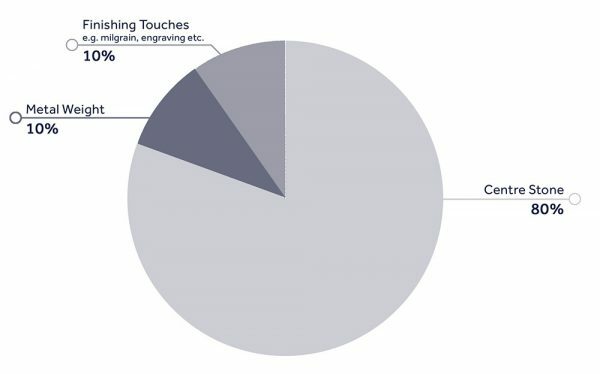 How much do people spend on an engagement ring? While there is certainly no ‘set’ amount someone should be expected to spend on an engagement ring, there are plenty of myths surrounding it. There’s the three-month’s salary rule, the one-month salary rule and even the split-the-difference rule. The nation that spends the most on engagement rings is the US, where the average cost of an engagement ring was at an all-time high in 2017, at $6,351 which is 25% higher than 2011. The average spend on engagement rings in the UK is significantly less, but this doesn’t mean that people are buying ‘less expensive’ rings. It’s more that consumers are steering away from tradition and exploring different designs, materials, styles etc. Consumers understand that they can get better value by actually learning more about diamonds, gemstones and engagement rings online before committing to a purchase. They engage in “showrooming” – shopping both online and in-store – allowing consumers to see options in person, while keeping their online price-point by purchasing online. An engagement ring is an enduring promise made to your beloved. Spend as much or as little as you are able to because no one should put a value on your love–it’s priceless. Millennials are now also designing and buying custom-designed rings from jewellers like us because they serve as expressions of their unique stories. Couples find inspiration in anything and everything, and for this special occasion, they’re keen to create something that connects them, a little secret only the two of them share. 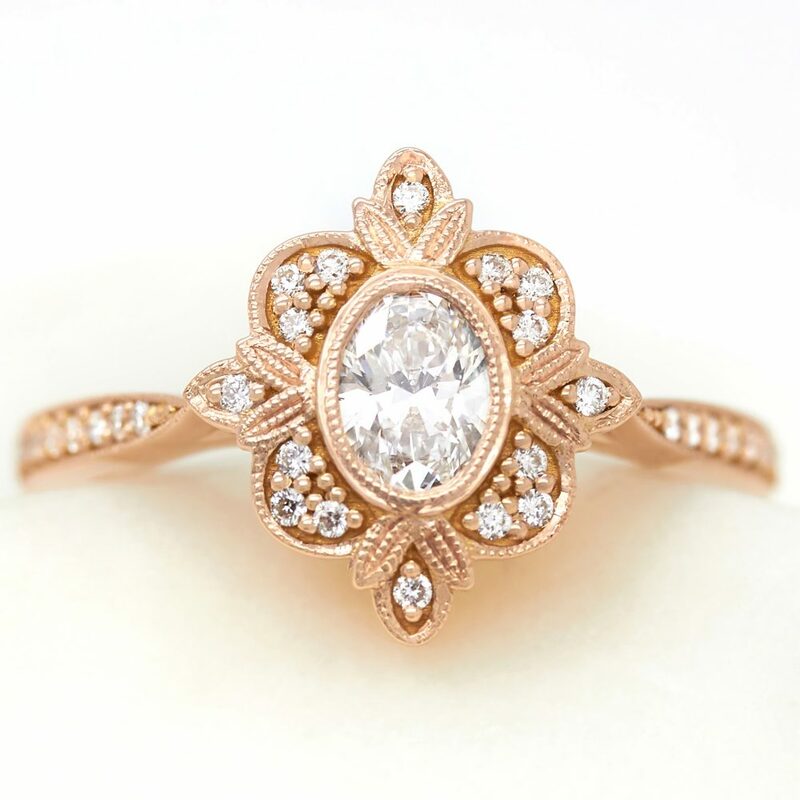 They aren’t drawn to a ring by its monetary value anymore, instead they place greater value on how that ring uniquely reflects the style and personality of its wearer. Once you know the price breakdowns of each engagement ring element, you can comfortably set your own budget and you’ll understand what you’re actually spending your money on. So before we dive in, it’s worth mentioning that at Taylor & Hart, our collection engagement rings start at around £865, set with a 0.3ct emerald-cut centre diamond. 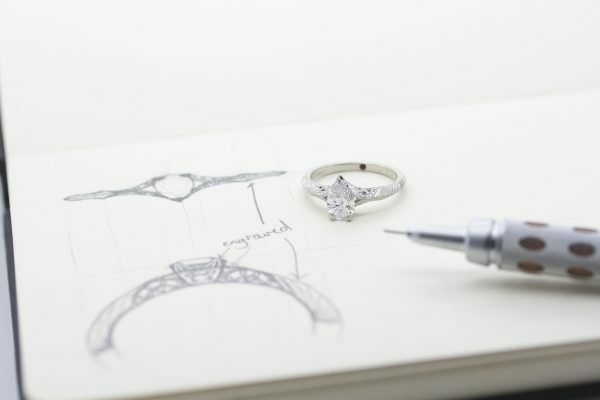 While our bespoke engagement rings begin at around £1,300 with a similar sized diamond or coloured gemstone. The main element that will affect the price of an engagement ring is the type of diamond or coloured gemstone and its quality characteristics. 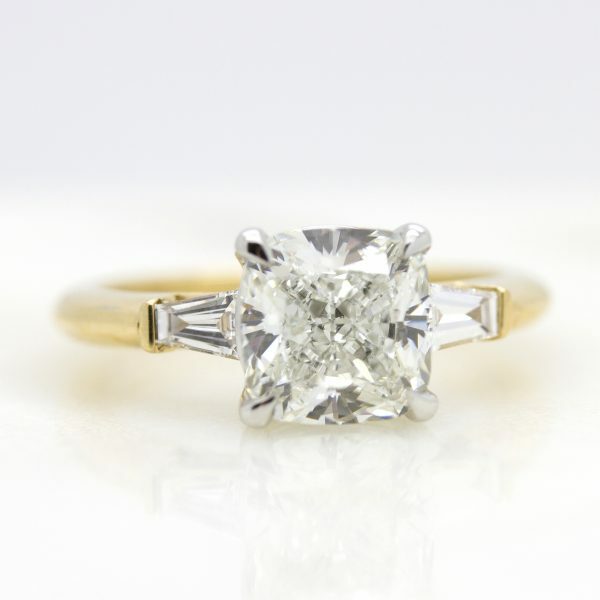 For example, when creating a solitaire engagement ring, the centre stone will often make up around 80% of the ring’s value. So how do I decide what carat weight to go for? A diamond’s carat weight refers to the weight of a diamond, not its size. A one carat diamond simply equates to 0.2 grams of diamond. 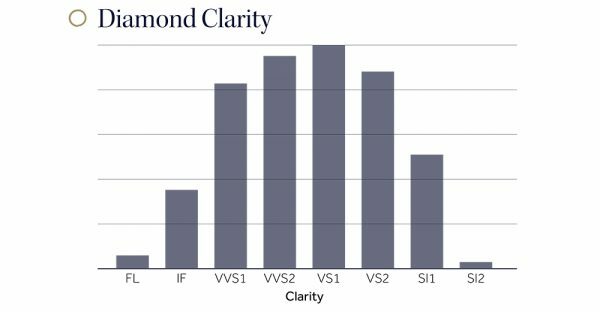 For the greatest balance of value and quality, for a platinum or white gold band, we recommend an Excellent cut, F or G coloured diamond with a VVS (very very slightly) or VS (very slightly) included clarity. 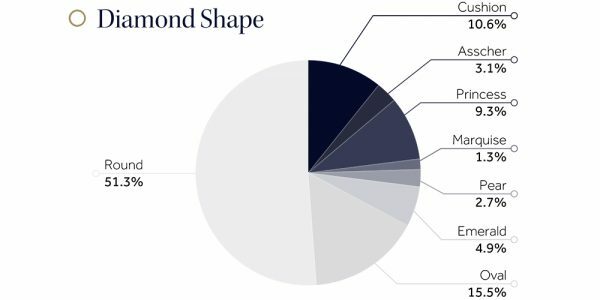 You can browse through over 100,000 diamonds on our diamond search tool to discover how different quality grades of diamonds retail for. You will notice that as well as carat weight, the shape, colour, cut and clarity will also affect a diamond’s price. How can I ensure my ring looks great, regardless of my center stone’s carat weight? 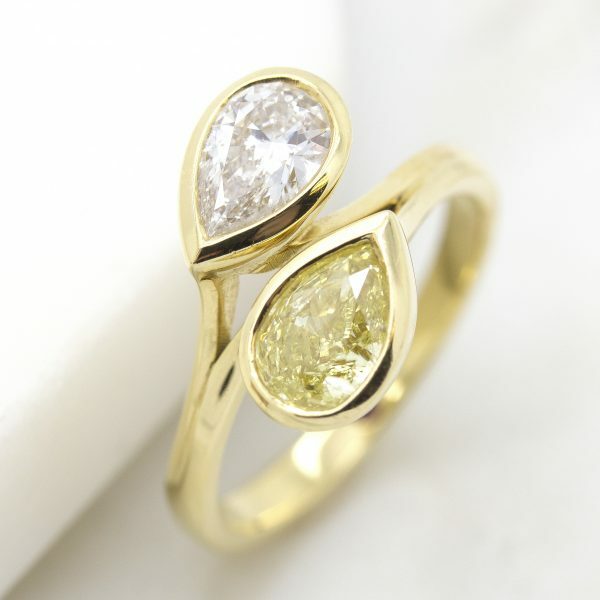 There are so many ways to design a ring in order to accentuate the size and appearance of your chosen centre stone. Here are some ways to ensure your diamond or gemstone is displayed the best way it can be. If you’re keen to stick within a set price point, it’s worth noting that diamonds of the same carat weight, but of a different shape will be priced differently. Round diamonds carry a premium over other shapes like a cushion, oval or princess cut because they produce the most waste in their cutting process. Choosing a fancy shape will often provide you with better value than choosing a much sought-after round diamond. Elongated diamond shapes like the marquise, oval and emerald cut can also appear larger in appearance, despite being the same carat weight. For example, a one carat G colour VVS2 round diamond is currently retailing for around £5,800 compared to a 1ct pear shape with the same quality grade, for around £4,785. This demonstrates the level of potential savings if you’re happy to choose a different shape to the traditional round. Only one carat out of every 10,000 carats mined is a natural fancy colour diamond. Their rarity and preciousness means that coloured diamonds carry a premium. A great way to include coloured diamonds in your design is by featuring coloured diamonds in the halo or pavé setting, which would carry a lower price point but still allow you to feature the much-sought-after coloured diamonds. 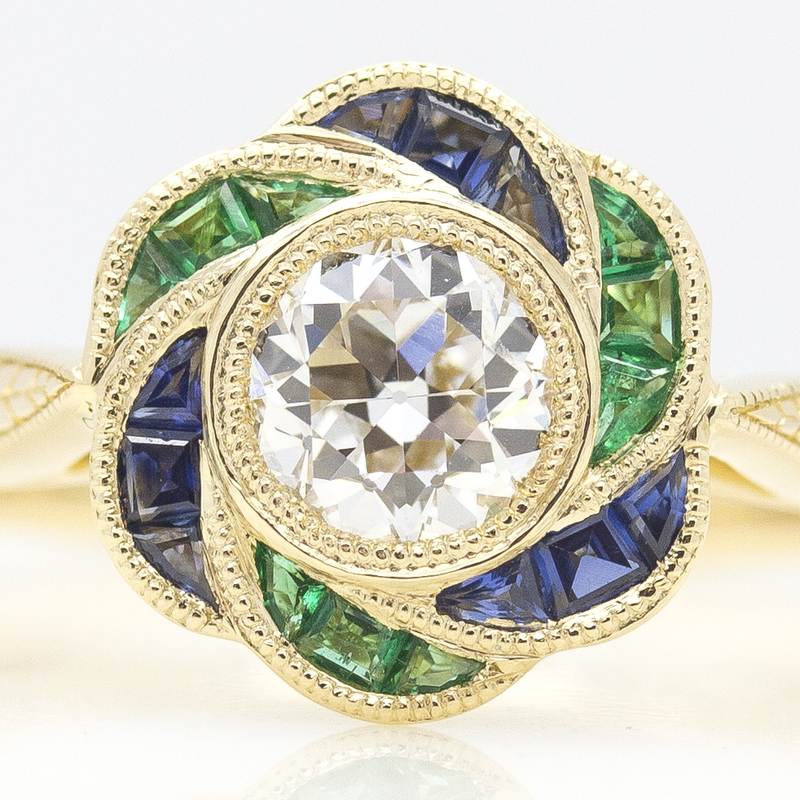 Alternatively, sapphires, rubies and emeralds are a popular choice for a vibrant splash of colour. They tend to carry a slightly lower price point, which usually means you can allocate more of your price point to a centre stone with a higher carat weight. 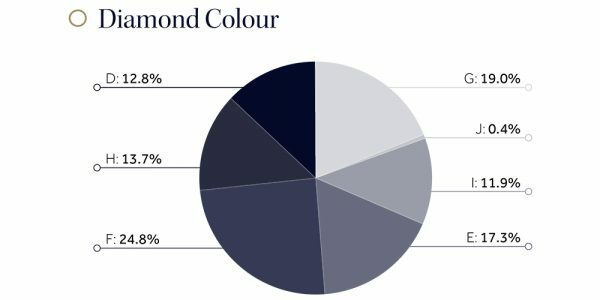 If you want a traditional white diamond, you have the option to go lower on colour grade if you’re having your diamond set in yellow or rose gold. Due to the very slight yellow tint in diamonds graded as ‘near colourless’ (G-J), their colour may be more apparent in a bright white metal, but would be masked when set against warmer tones of yellow or rose gold. This is not to say that ‘near colourless’ diamonds will have a visible tint when set in white metals. It simply means that you have the option to drop the colour grade further than you might otherwise if your ring will be cast in yellow or rose gold. A trilogy engagement ring, or sometimes called a three-stone engagement ring, or trinity engagement ring, is simply a design style that features three diamonds or gemstones at its centre. Each of the three stones singularly symbolises your past, present and future together as a couple. Many people think that a trilogy is out of their price range because there are three stones, however the flanking stones will typically cost far less than the centre stone. Generally speaking, the centre stone will often be larger to signify the importance of the ‘present’ and will require the bulk of your budget. A halo of diamonds or other precious stones surrounding your centre stone is a great way to enhance the overall appearance of your ring. The halo gives the illusion of the centre stone being larger than it actually is, while also providing a dramatic, cluster effect to your design. The mount, or the metal of an engagement ring can affect the overall price of your ring. If you are struggling to stick to a tight budget, going thinner on your band width or tapering the band at either side of the centre stone will reduce the weight of your ring. Metal value is charged in grams so naturally, the heavier your design, the higher the price. Comparably, platinum comes at a premium to gold. Each engagement ring can feature a number of finishing touches– a design element, small or large, that gives the final ‘look’ to your ring. These range from milgrain (small beading used to frame a ring’s design) to engraving or filigree metal cut outs. 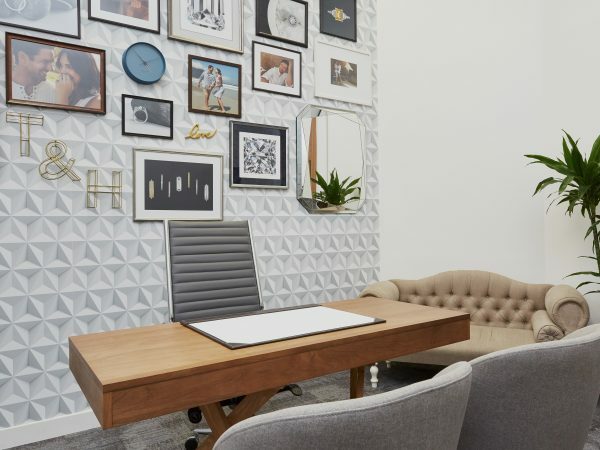 These design elements will add to the overall cost of your design because they require more time and craftsmanship. However, these can be great ways to add detail to a design that features a single stone. What shouldn’t I compromise on? Great! So I know how to accentuate the appearance of my ring. What shouldn’t I compromise on? The Gemological Institute of America is an international non-profit organisation dedicated to producing consistent, accurate and unbiased grading reports. Each stone is graded twice, by different graders, to ensure they arrive at the same grading report. GIA developed their grading system so you can choose a diamond without seeing it, yet still, trust you’re getting exactly what you paid for. 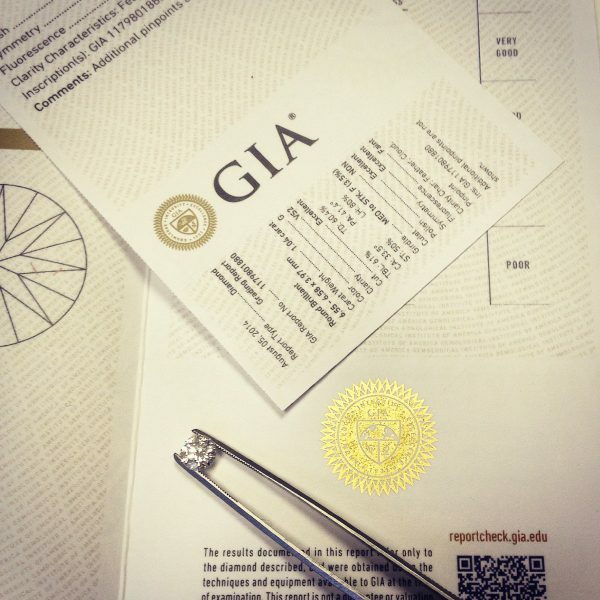 While there are other diamond grading laboratories available, diamonds graded by the GIA are certainly the most highly valued and respected in the industry. 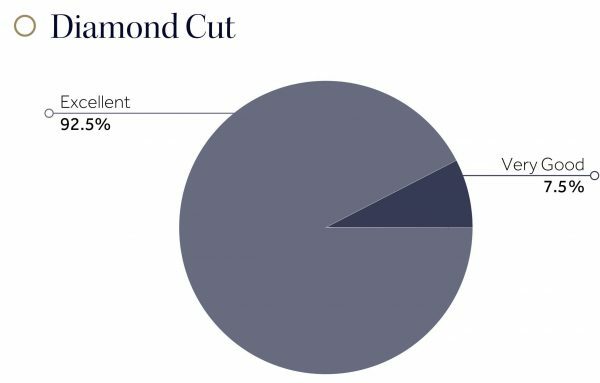 The chart below shows the high percentage of customers who opt for excellent cut diamonds. Platinum and 18ct white gold share a similar bright, white appearance. To give white gold its sought after bright sheen, white gold engagement rings are plated with rhodium. 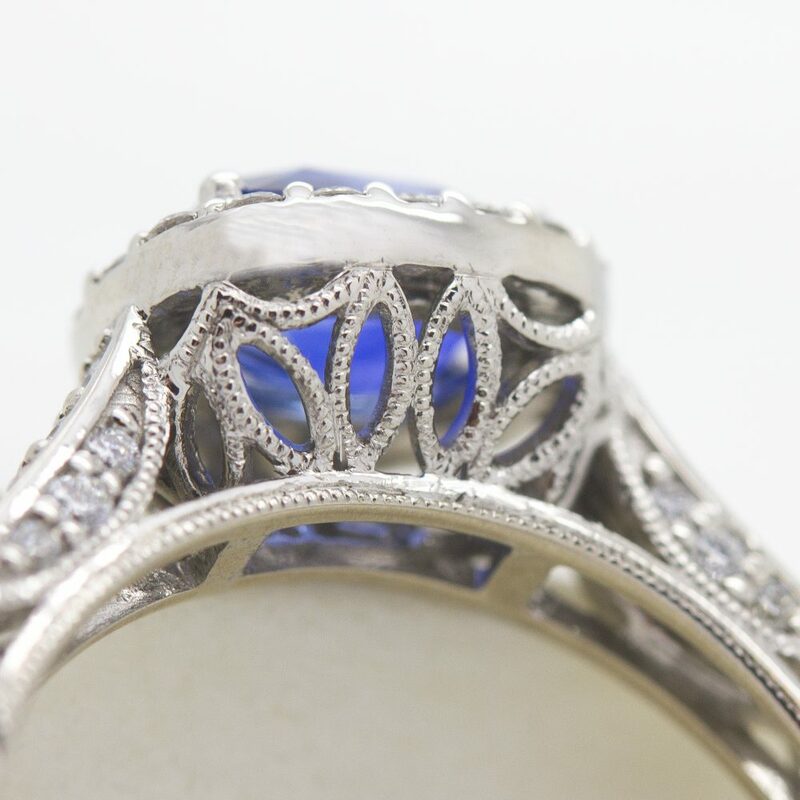 With time, rhodium plating will wear away and need replacing every 12-24 months to maintain its lustre and radiance. Platinum engagement rings, on the other hand, don’t require the same level of maintenance due to its natural white colour. 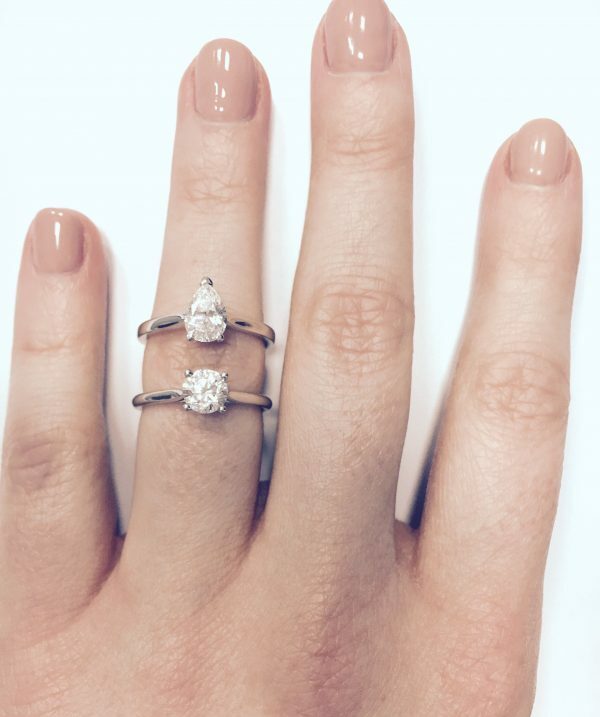 So what do people actually choose when it comes to their engagement ring? Round, VS1/VVS2, F/G, excellent cut. As previously mentioned, cut quality grade is only applicable for round diamonds. 92.5% of round diamonds we sell are an excellent cut grade, which means they have the optimum brilliance, sparkle and light dispersion. 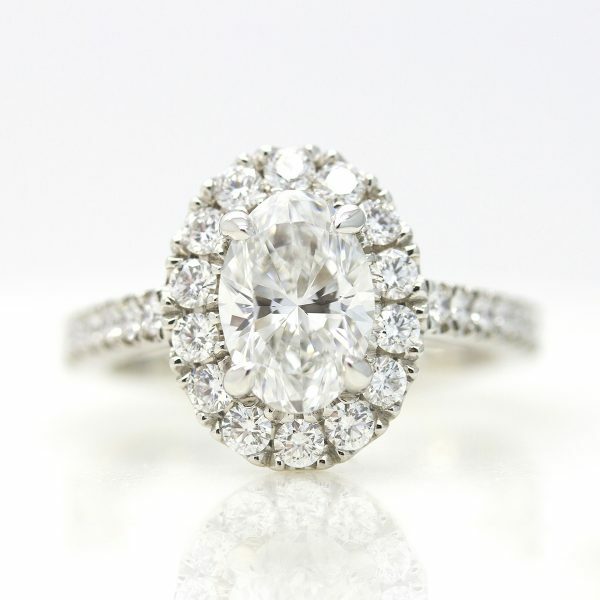 The most popular shape is the round, with over 50% of customers choosing this iconic engagement ring shape. The next most popular shapes are oval, cushion and princess, which often offer better value. 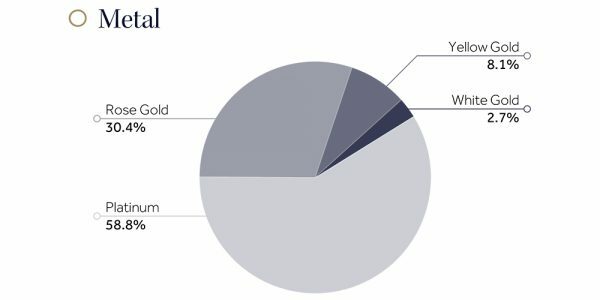 Platinum is the most popular metal choice amongst our customers with 58.8% of rings being crafted in this metal, while 41.2% of rings are crafted in 18ct gold. Following the contemporary trend of blushy toned jewellery, 30.4% of rings are crafted in rose gold, 8.1% in yellow gold and just 2.7% are crafted in white gold. White gold has a low percentage because while it offers a practically identical appearance to platinum, is should be re-plated with rhodium every 12-24 months. Platinum does not require the same level of maintenance, making it a preferred choice for an item of every day jewellery. The average carat weight for a centre diamond averages at around 0.79ct. Coloured gemstones often provide slightly better value for money, resulting in an average carat weight for coloured gemstones averaging at around 0.96ct. Throughout 2018, the average spend on engagement rings for our UK customers was £4,144. In summary, as a smart shopper, how do I maximise the value I receive when considering the engagement ring’s cost? 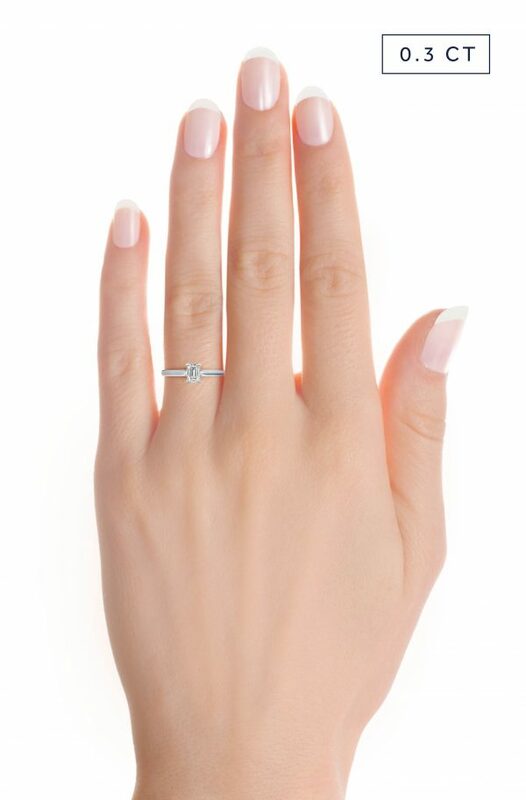 Choose a ring design from our collection. Fully custom rings carry a premium over our collection pieces because of the sheer amount of extra work that must go into them. With over 100 different designs in our engagement ring collection, you’re guaranteed to find one that suits your requirements and taste. If you’re looking for a diamond engagement ring, choose a G/H colour and VS2 clarity. This combination looks stunning and does not carry the premium of higher clarity and colour grades. Choose a ring setting with less side diamonds. 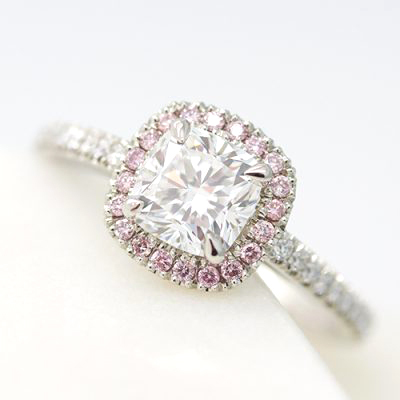 Pavé and halo engagement rings have a higher price point than solitaires. 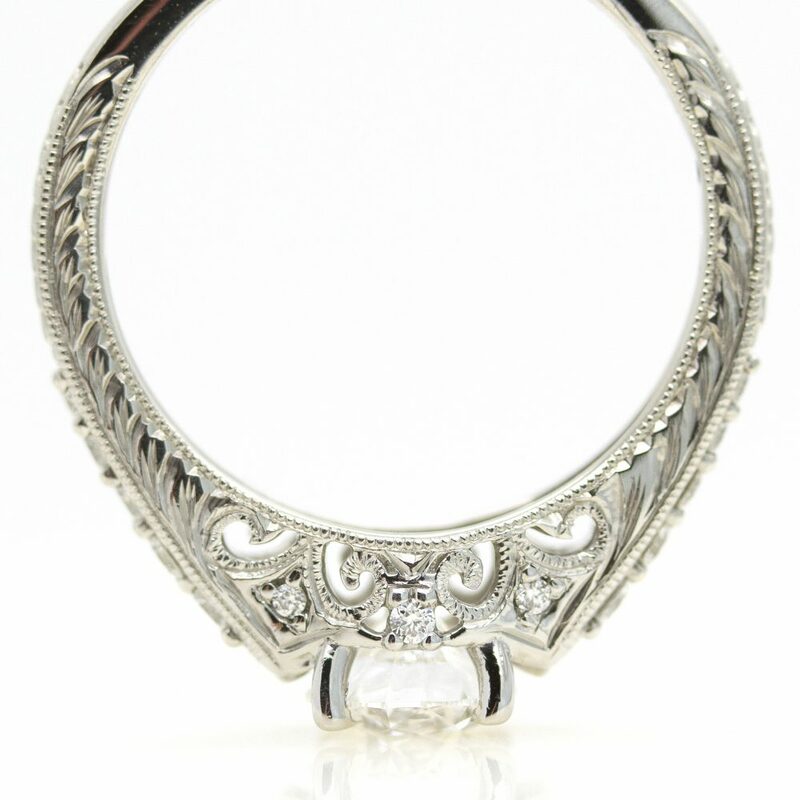 Instead, you can add flair and detail using design elements like milgrain, engraving, filigree etc. If the size of the centre stone is important, choose a fancy shape diamond or gemstone instead of a round. Fancy cut gemstones are priced lower than round brilliant diamonds. Ultimately, there is no “right” answer for calculating what you should spend on an engagement ring. Dispel the myths and spend what you’re comfortable with. *The prices in this post are valid on day of publication but prices may change and most often increase over time.